BACKGROUND AND PURPOSE: With functional connectivity functional MR imaging, covariance in signal intensity has been shown in functionally related regions of brain in participants instructed to perform no cognitive task. These changes are thought to represent synchronous fluctuations in blood flow, which imply neuronal connections between the regions. The purpose of this study was to map functional connectivity in subcortical nuclei with functional connectivity functional MR imaging. METHODS: Imaging data were acquired with an echo-planar sequence from six volunteers who performed no specific cognitive task. For functional connectivity functional MR imaging, a “seed” voxel or group of voxels was selected from the resting data set in the thalamus or in the hippocampus. Control voxels in gray matter presumed not to be eloquent cortex were also chosen. The correlation coefficient of the seed voxels and the control voxels with every other voxel in the resting data set was calculated. The voxels with correlation coefficients greater than or equal to 0.5 were mapped onto anatomic images for the functional connectivity functional MR images. The anatomic location of these voxels was determined by conventional parcellation methods. RESULTS: For each participant, functional connectivity functional MR imaging maps based on four seed voxels in the thalamus or hippocampus showed clusters of voxels in the ipsilateral and contralateral thalamus or hippocampus. For control voxels, few voxels in the hippocampus or thalamus showed significant correlation. Significantly more pixels in the ipsilateral hippocampus correlated with the seed voxel than in the contralateral hippocampus. The differences between numbers of functionally connected voxels in ipsilateral thalamus and those in contralateral thalamus were not significant. CONCLUSIONS: The thalamus and hippocampus show functional connectivity, presumably representing synchronous changes in blood flow. The term functional connectivity describes the interdependence of brain regions that are functionally related and interconnected. Manifestations of functional connectivity include the interdependence of spike trains in motor regions of the right and left hemispheres (1, 2), the covariance of metabolic rates in functionally related brain regions (3), EEG (4), and, most recently, by the synchronous changes in signal intensity of functionally related brain regions (5–7). Signal intensity fluctuates slowly in the brain, probably as the result of fluctuations in blood flow. The signal intensity changes detected by functional MR imaging correspond in frequency and magnitude to slow spontaneous regional cerebral blood flow changes that have been shown in the mammalian brain (8). The fluctuations in signal intensity are thought to be caused by the slow fluctuations in cerebral blood flow in the “resting brain.” The coherent changes in signal intensity, metabolic rate, and blood flow imply neuronal connections. The reason for the coherent changes is not known, but it is postulated that synchronized oscillations provide a signal that adjusts the strength of existing synapses (9). Functional connectivity potentially represents a useful noninvasive tool with which to investigate the strength of distributed networks in the brain in healthy participants and in patients with neurologic and psychiatric disorders. Although focal disorders of the cerebrum may be detected by means of imaging or functional studies, disorders related to the function of large distributed networks might be detected better with probes of functional connectivity. Although first revealed by functional MR imaging in the motor cortex, functional connectivity has been subsequently shown to be a characteristic of multiple eloquent cortical regions. The demonstration of functional connectivity in subcortical regions would suggest a larger value of functional connectivity functional MR imaging as a research tool. With functional MR imaging, functional connectivity has been measured in the motor cortex, visual cortex, and auditory cortex (5, 10, 11). For the purpose of measuring functional connectivity, a sequence of images is acquired without the participants performing a task. In these series of images, a seed voxel is selected in a region that has shown activation on a task acquisition study. The time course of the seed voxel is cross-correlated with that of every other voxel in the data set. The voxels correlating significantly with the seed voxel are mapped onto the anatomic images. For a seed voxel in visual cortex, most of the voxels in the ipsilateral and contralateral visual cortex have significant correlation. For a voxel in the primary auditory cortex, voxels in both the ipsilateral and contralateral auditory cortex have significant correlation. To our knowledge, the functional connectivity of the subcortical gray matter has not been reported in detail. Therefore, we used functional MR imaging to measure the functional connectivity of the thalamus and hippocampus. Hypothetically, functional connectivity exists within the thalamus and hippocampus, which have extensive neuronal connections with each other and with other cerebral and posterior fossa structures. Although the connections in the thalamus are numerous and complex (12), we intended to sample the region in the thalamus adjacent to the third ventricle occupied by the medial thalamic nucleus, which has connections mainly with orbitofrontal and prefrontal cortex and hypothalamus and amygdaloid nuclei. Volunteers were recruited for the study, and informed consent was obtained. Exclusion criteria included claustrophobia, a history of neurologic illness or other serious medical problem, and a contraindication to MR imaging. MR images were acquired using a 1.5-T commercial imager equipped with high-speed gradients. Preliminary anatomic images were obtained with multislice spin-echo sequences. For functional connectivity functional MR imaging, a series of 256 echo-planar images was acquired at a rate of 0.5/s at 18 locations in the coronal plane. Technical parameters for these acquisitions included 18 sections, 64 × 64 matrix, 90° flip angle, 2000/50 (TR/TE), 24-cm field of view, 125-kHz receiver bandwidth, 7-mm section thickness, and 2-mm gap. Voxel dimensions were 3.75 × 3.75 × 7 mm (x, y, z). The echo-planar raw data were filtered in the spatial frequency domain with a low pass Hamming filter (7). The signal intensity was plotted as a function of time for each voxel. A three-point Hamming filter was applied for temporal smoothing of the signal. Signal intensities in each section were time-corrected by a shift of the smoothing filter corresponding to the temporal offset. A low pass filter was applied in the frequency domain to remove respiratory and other noise frequencies greater than 0.08 Hz. A band reject filter was not used because of the small effect of cardiac frequency aliases. To avoid the need to use motion correction, data with evidence of head motion were not used. Functional connectivity was measured by the seed voxel method. A cluster of four contiguous seed voxels was selected in the right and left hippocampus and the right and left thalamus, and the signal for the cluster was averaged for each time point. Standard anatomic landmarks were used to identify these structures. The correlation coefficients of the seed voxel cluster and every other voxel were calculated. The numbers of voxels with correlation coefficients equal to or greater than 0.5 were tabulated. 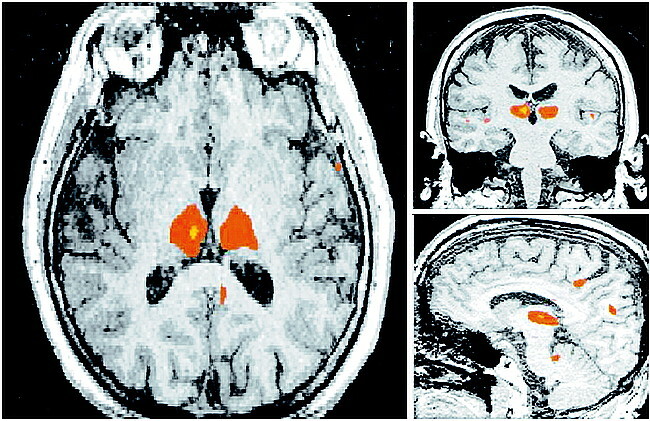 The voxels correlating significantly were merged with anatomic images to produce the functional connectivity functional MR imaging. Standard parcellation methods were used to determine the location of the significantly correlated voxels (13). The number of voxels in the ipsilateral and contralateral hippocampus and thalamus were tabulated. Control pixels were selected in cortical gray matter in the inferior temporal lobe outside of healthy eloquent brain regions. The correlation coefficients of these control pixels with every other pixel in the data set were calculated. 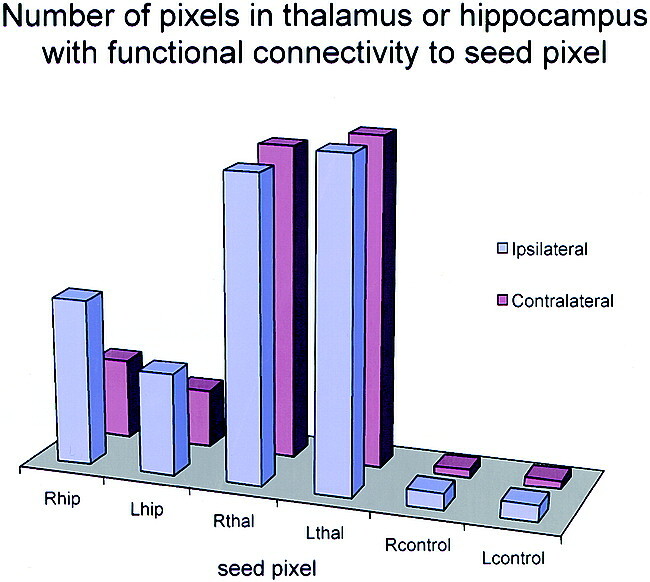 Numbers of voxels in the thalamus, hippocampus, and outside these areas were counted and tabulated. The total number of voxels with correlation coefficients equal to or greater than 0.5 were counted using 3dclust (AFNI; Robert Cox, Medical College of Wisconsin). Those voxels in the ipsilateral and contralateral hippocampus and thalamus were counted. A paired Student's t test was conducted to determine whether one seed voxel had significantly different numbers of cross-correlating voxels in the hippocampi than did a cluster of four seed voxels. In addition, a paired t test was used to determine whether the number of cross-correlating voxels in the ipsilateral hippocampus or thalamus differed from the number in the contralateral hippocampus or thalamus. Six volunteers (ages, 20–36 years) were studied. Technically satisfactory functional connectivity functional MR imaging maps were obtained for each volunteer. No studies were discarded because of motion. For single seed voxels in the left or right hippocampus, voxels in the ipsilateral and contralateral hippocampus correlated significantly in all cases (Fig 1 and Table). On average, 13 or 21 voxels correlated with the seed voxel in the ipsilateral hippocampus of volunteers and, on average, 10 or seven in the contralateral hippocampus. The difference in the numbers of pixels in ipsilateral and contralateral hippocampus was statistically significant (P < .02, Student's t test). The number of voxels correlating with the single voxel or the cluster did not differ significantly (P > .9). On average, 10 to 13 voxels in the ipsilateral or contralateral thalamus cross-correlated with the seed voxel in the hippocampus. 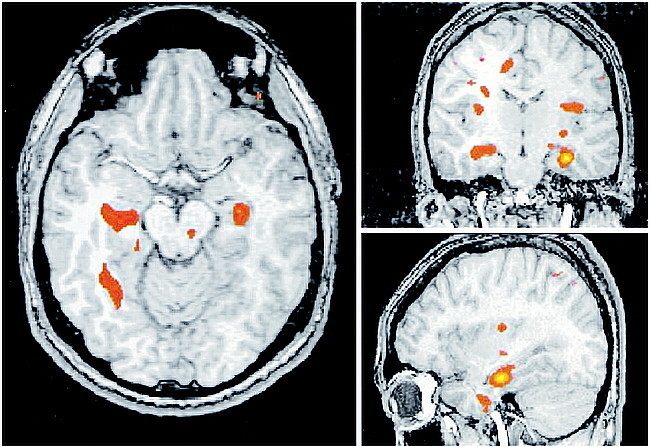 Clusters of voxels that cross-correlated with the seed voxels were also noted in the cingulate gyrus, the sylvian fissure region, and the thalamus bilaterally (Fig 2). Clusters of voxels that correlated with the seed voxel in the hippocampus also could be seen in the frontal, temporal, and parietal lobes. Occasionally, clusters of voxels in the putamen, the cerebellum, and the precentral gyrus correlated significantly with the seed voxel. Few voxels in language or visual cortex cross-correlated significantly. For a seed voxel or a cluster of four contiguous seed voxels in the hippocampus, the number and the location of cross correlating voxels were similar. For a seed voxel cluster in the right thalamus, 38 voxels on average in the ipsilateral thalamus and 39 voxels in the contralateral thalamus correlated significantly (Fig 1 and Table). For the seed voxels in the left thalamus, the average number of correlated voxels in the ipsilateral or contralateral thalamus was 41. Many additional regions had significant cross-correlation to the thalamic seed voxels (Fig 3). These included the basal ganglia, the cerebellum, the cingulate gyrus, and, occasionally, the hippocampus. For seed voxels in the left or right thalamus, 12 to 15 voxels on average in the right and left hippocampus correlated significantly. Seed voxels chosen outside of presumed eloquent cortex resulted in few voxels with significant correlation coefficients in either thalamus or hippocampus. In the healthy volunteers, the number of voxels in the thalamus or in the hippocampus cross-correlating with a voxel selected in noneloquent cortex was one to four. In this study, seed voxels chosen in the hippocampus or thalamus had highly significant correlations with voxels in the ipsilateral and contralateral hippocampus. When a control voxel was used for cross-correlation, few voxels were identified in the hippocampus or thalamus that had significant cross-correlation. This study provided evidence of functional connectivity in the thalamus and hippocampus. The voxels cross-correlating with the seed voxels in the thalamus or hippocampus were not exclusively in the thalamus or hippocampus. Voxels in basal ganglia, cerebellum, cingulate gyrus, and frontal, temporal, and parietal regions cross-correlated significantly with the seed voxels. Because the hippocampus and thalamus have projections to many brain regions, functional connectivity with many of these regions is expected. Determining the pattern of connectivity between thalamus and hippocampus and other brain regions requires additional studies. Functional connectivity has been shown by means of seed voxel analysis in visual, auditory, and motor cortices (5, 6). To our knowledge, functional connectivity studies of basal ganglia and other subcortical structures have not been reported. The growing body of literature on functional connectivity shows that synchronous fluctuations in blood flow are not a manifestation of brain tissue in general but are a characteristic of functionally related brain regions. Within an eloquent brain region, most voxels have highly significant correlation coefficient with other voxels in the same eloquent region and with voxels in more distant parts of the brain that have large network connections. For a seed voxel chosen at random, the chance of another voxel within the hippocampus or thalamus cross-correlating with it at 0.35 or greater is less than 1% (5). Functional connectivity may in principle occur between any brain structures that are connected by large distributed networks. Thalamus and hippocampus have connections with a large number of cortical and subcortical brain regions (eg, the anterior thalamic nuclei connect with the prefrontal and orbitofrontal cortex and cingulate gyrus). The ventromedial thalamic nuclei connect with the orbitofrontal, insular, and temporal cortex and basal prosencephalon. The ventral group of nuclei, pulvinar, and lateral posterior nuclei interconnect with frontal, parietal, temporal, and occipital lobe cortex (12). For our study of functional connectivity, we selected the medial portion of the thalamus, which has connections with hypothalamus, amygdala, and orbitofrontal and prefrontal cortices. The possibility that seed voxels encompassed portions of the thalamus other than the medial thalamic nucleus cannot be excluded. This study was preliminary, and further studies of functional connectivity in subcortical structures are indicated. In our study, only selected voxels in the hippocampus or thalamus were studied because of the considerable processing time. The number of voxels correlating with the seed voxel varied with the seed voxel or cluster chosen. The possibility of a bias due to the voxel selection was not controlled except by measuring the cross-correlation with a control voxel outside the basal ganglia and outside of eloquent cortex. The use of a voxel cluster and a Hamming filter increased the likelihood of correlation in neighboring voxels but not in distant voxels. When the Hamming filter was eliminated, the numbers of correlating pixels decreased. An automated method of detecting functionally connected voxels was not used, but in the future, independent component analysis may represent a useful method for confirming these results (12). This study suggests that functional connectivity functional MR imaging reveals functional connectivity in subcortical regions as it does in eloquent regions of cerebral cortex. Further studies of functional connectivity are warranted. Functional connectivity functional MR imaging may be an effective tool for evaluating large distributed networks in the human brain, in healthy volunteers and in patients. ↵1 Address reprint requests to Victor Haughton, MD, 600 Highland Avenue, Department of Radiology, Clinical Sciences Center, Module E3, Madison, WI 53792. Cordes D, Wendt G, Turski PA, Meyerand ME, Moritz C, Quigley M, Arfanakis K, Haughton V. Mapping functionally related regions of brain with functional connectivity MRI (fcMRI). Accepted after revision February 18, 2000.